I got Glamour Do in the mail over the weekend, so I figured I would try it out. 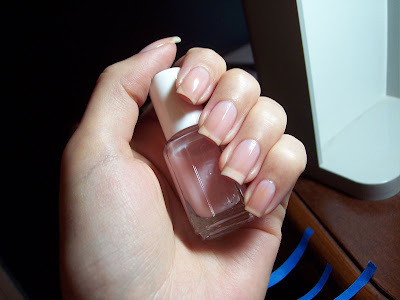 It's a very subtle pink, great for a natural looking french manicure. The bottle is tiny! This is 3 coats, don't mind my stained and icky nails. This is after I painted the tips, I use blue painters tape (left it in the background of the first pic so you can see). It's not too sticky, it's flexible and I had it already so it's a win win. I did not like the harsh white so I did a fourth coat over the white to mellow it out a bit. Hard to see in the pictures! This is screaming for some nail art so I'll be doing that later probably. 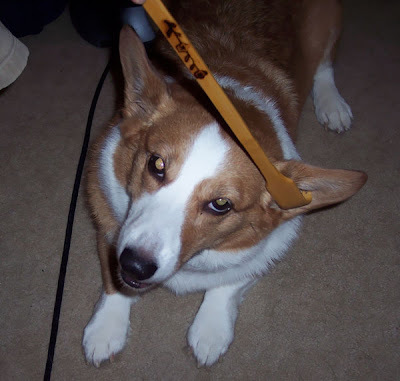 One of my dogs Jasmine loves getting scratched with a back scratcher, how funny is that! Hi Kae - what a great idea to use painters tape! I got Glamour Do too, the bottle is really tiny and not much color to it either, lol. Your french looks great though, can't wait to see what sort of nail art you will come up with for this. Hi Kae, this is so pretty I like your idea of a painters' tape, I wish I could a do a french, oh well in the meantime I just admire yours! That's a great idea using painters' tape. I also wish I had a free edge to do a french in a deep color. My nails are very short. I just cut the last of the peeling edges off.